I was contemplating this post as I was lying in bed this morning. I don’t know that the post has a specific points. Which is why I just called it “musings”. While I was lying in the bed, I heard the school bus coming down the road. “Thank goodness I don’t have to be up already.” I thought. It was almost 7. I was enjoying a few quiet moments before I got up. BigG wouldn’t be up for at least another hour. I laid in bed a little longer than usual this morning. I knew when I got up and logged on the computer I would be bombarded with “first day of school pictures” on Facebook. Now I’m up, sipping a smoothie and trying to get a little work done, in the quiet. Can I point out how glad I am we don’t have the “get up, get dressed, eat breakfast, get out the door” morning routine? BigG does better when he’s had a good night’s sleep and gets to wake up at his pace and start his day on his terms. Aren’t we all that way? I’ve read several articles lately about how early school times are making it hard for kids to get enough sleep (here and here are two of them). That’s why I’ve decided to not wake BigG up at a certain time in the morning just for the sake of having him be up. He’s 6. If his body stays asleep until 9 then it needed it to make up for a particularly busy few days or using a lot of energy the day before swimming, at the park, etc. So, on to the “first day of school” pictures all over Facebook this morning. I do love seeing my friend’s kids smiling faces and excitement over their first day of school. I am happy for them. We never did the public school thing. BigG went to day care/preschool from 12 weeks to 5 years old…but I always worked in the same building at the time. 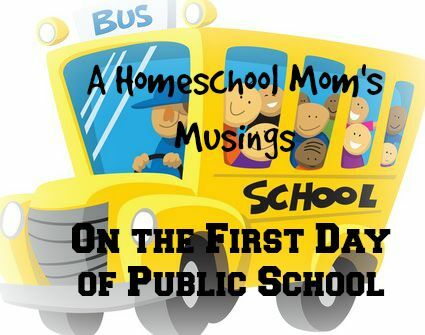 Then last year we jumped into homeschooling with both feet. Last year I thought I would be sad when all those pictures started flooding my newsfeed. But I wasn’t. Today I was afraid I would be sad even though I wasn’t last year. But I’m not. In some ways, the first day of school solidifies my decision to homeschool. Being in bed when the bus goes by, BigG getting to sleep in, starting our morning on our terms, no rushing out the door. It just feels like the way life should be. It works for us. Now, if you’ll excuse me, I hear little footsteps coming this way. That means it’s time for breakfast. We have karate later this morning and then we’re going swimming. Happy first day of school – no matter when or where yours is!